Miss Georgia's Outstanding Teen is the official preliminary to the Miss America pageant. The winner of Miss Georgia's Outstanding Teen represents Alabama's Outstanding Teen at the Miss America’s Outstanding Teen pageant for a chance to win the title of Miss America’s Outstanding Teen. Miss Georgia's Outstanding Teen has four phases of competition that include: private interview, on-stage question, talent and evening gown. In order to compete for Miss Georgia's Outstanding Teen must be at least thirteen (13) years of age on the first day of the State Competition in which she competes and must not be older than seventeen (17) years of age as of July 31st in the calendar year of the State Competition in which she competes, unless she is 18 years old and has not graduated from high school as of July 31st in the calendar year of the State Competition in which she competes have won a preliminary title. After Miss Georgia's Outstanding Teen is crowned, the rest of the year is aimed at booking appearances for her and helping with local pageants for the next year. Miss Georgia's Outstanding Teen makes three to five appearances per week and her fees are available upon request. Miss Georgia's Outstanding Teens have made many exciting appearances. They have been to rattlesnake roundups, to the Rose Bowl, to Vietnam with the Miss America Outstanding Teen USO Troupe, the Mexico and Japan as goodwill ambassadors, to March of the Dimes’ Telethons, to entertaining hundreds of specials needs children at the Springer Opera House, to State Theatre of Georgia, to the Governor’s Mansion, to the White House and to sing for the President of the United States. 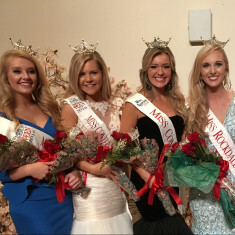 The Outstanding Teen pageant began in 2001, with the crowning of Joanna Smith, followed by Diana DeGarmo in 2002, Addie Hampton (2003), Mandy Best (2004), Kristen Springer (2005), Lauren Edmunds (2006), Michaela Lackey (2007), Hilary Pulos (2008), Brianna Godshalk (2009), Camille Sims (2010), Julia Martin (2011), Jameson Kennerly (2011), Kelly Hutchinson (2012), Olivia McMillan (2013- Miss America's OT), Abigail Feltner (2014- took over for Olivia McMillan), and Kelsey Hollis (2016). Miss Georgia's Outstanding Teen accepts competition entries by winning a local pageant. The winners of local pageant across the state will compete in the STATE pageant, and ultimately compete for the title of Miss Georgia's Outstanding Teen. This pageant searches for a well rounded, talented, mature, intelligent teen that will represent the state of Georgia at the Miss America Outstanding Teen pageant and during her year of service for the state. This is a scholarship pageant centered around a well-rounded teen and promotes the involvement of a teen in their local community.